We had a conversation at the Cambridge Buddhist Centre the other night that parallels similar discussions I had in several places. Indeed I've asked the question myself before. Who is around now that is Awakened? And why to people keep fobbing me off when I ask the question? My response is that this is a difficult question to answer. For a start, would we know an Awakened person if we met them? We might if we spent some time observing them. But in a chance or glancing encounter we may fail to recognise their special qualities. There are ample stories of this nature in the Pali Canon. Then what would it mean for someone to say that someone they know is Awakened? Surely we would have to have an inordinate amount of trust in our informant for their words to make much difference in our lives. What would it mean if we ourselves said someone was Awakened? What it comes down to, and this came out in our conversation, is that we want guarantees that the Dharma is going to make our lives better. Having someone who totally exemplifies the Dharma would make believing a lot easier. Where is the Buddhist messiah to save us from ourselves? But actually the Dharma never really operated this way. The Buddha of the Pali Canon doesn't go around saying: take this on faith. The Dharma, he says, is ehipassiko. Ehipassiko literally means 'come and see'. And in a way this is better than having a messiah! What we do is we start to practice a little mindfulness and we evaluate the results. Most people, however difficult they find it, report that being a bit more mindful makes them a little happier, a little more alert, a little less stressed. We are then ready to take the next step whatever that might be for us. We may need a teacher who can show us the next step, although often after some experience of practising, it is obvious to us what our next step should be. Often what we want is a teacher who has all the answers, who can advise us on every crisis, who can guide our every step. We want a messiah. We are not ready, willing, or able, to take personal responsibility for our consciousness. But having been given a few basic tools, most of us are quite capable of making progress in the Dharma. The original model of practice in Buddhism was often very simple. Someone would meet the Buddha or one of his disciples, they would be given a Dharma talk in the course of which they became firmly convinced of the truth of the Buddhadharma. They would then be given a method of meditation, or a subject for reflection, and be sent off to practice. Alone in the jungle they would use this single tool to penetrate the nature of reality, Awaken to the truth of it, and then return to report on their findings. What we get these days, with some exceptions, is elaborate systems of practice with a bewildering variety of approaches, 1000's of books, and 1000's of Dharma talks, all giving us much to think about. Rather than the simple certainty of a straight forward approach, we get a plethora of ideas, most of which we cannot hope to put into practice. There's really no point at all in reading about the highest yoga tantras if we cannot sustain basic mindfulness. Very few people would read a book on advanced physics before having thoroughly studied the foundations and expect to get anything out of it. There is a case for reading inspirational literature. The lives of Buddhist saints can be very inspiring. But lets face it, most of us need to be looking much closer to home. The good news is that if we take this incremental approach to practice then we do make progress. And our confidence in the Dharma gradually increases, not on the basis of our guru's charisma or through blind faith, but from actually experiencing the results of practice first hand. My own confidence in the Dharma is not dependent on my teachers, nor on any external reference. I practice the Dharma because I know for myself that it does me good, and I include in this that it enhances my ability to be altruistic. We don't need to have anxiety about whether our current teachers are awakened. No one can live our life for us, and even if we had a teacher who is Awakened, we'd still have to understand the teaching, and make the effort to practice. The only guarantee that we need comes from our own experience of practice. Doubts are resolved through practice, not through someone telling us it's OK. Recently a man has been in the news. Mr Kember was rescued from being abducted in Iraq. He apparently did not express sufficient gratefulness to the army for rescuing him. His reasoning was, apparently that the army were the cause of his kidnap in the first place, and that had they not invaded Iraq a lot of killing and suffering might not have happened. This is all up for debate in the media and one can hear, see or read a variety of opinions on the subject. Will of ThinkBuddha.org has written some very salient articles on conditionality recently (1, 2, 3) . Isn't it interesting how, by focusing on different aspects of the infinite web of conditions, we can come to polar opposite conclusions about an event. I wanted to look at one aspect of this web of conditions. The 25th of April is ANZAC Day in New Zealand (and in Australia). This is an interesting public holiday. On the surface it is a simple commemoration of the dead in both World Wars, and in particular the first. Below the surface however is another current. Ask any New Zealander and they will tell you that the New Zealanders' sense of identity as distinct from the English emerged during this time. 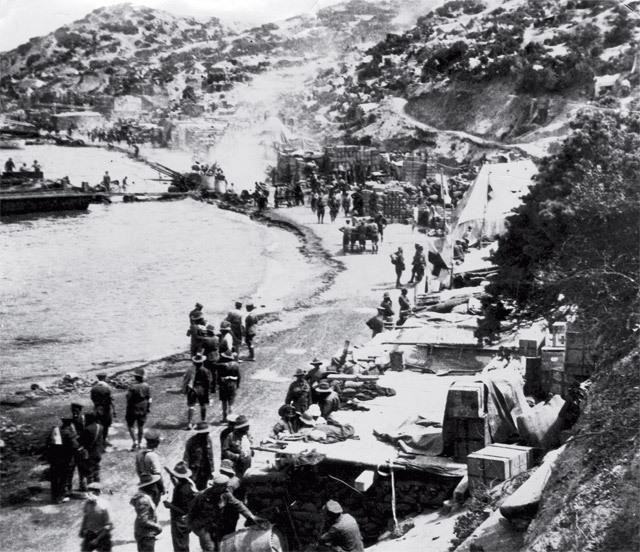 Gallipoli stands out as representing the New Zealand experience of WWI - a futile, strategically useless attack on what may have been the strongest part of the Turkish defences. What Churchill was thinking is not clear to most people, and we might speculate that perhaps his heavy drinking started well before he became Prime Minister. The New Zealanders, who were, it must be said a minority on the beaches at Gallipoli, came to see themselves, like I do, as not English. Having spent four years living in England I can tell you that I get daily reminders that I am in a foreign culture. ANZAC Day then is a day which celebrates national identity. And that identity has been bound up from the beginning with the military. Our National Anthem beseeches God to protect us from the shafts of strife and war. 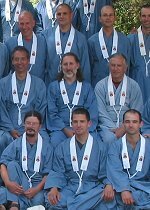 About 12 years ago I became a Buddhist. Having spent my teenage years being convinced that Ronald Raygun was going to start a nuclear war with Russia, I didn't think much of the military. Buddhism reinforced these views. I became quite rabidly anti-military. I probably even, without any sense of irony, became angry about the activities of the military. I celebrated the father of New Zealand poet James K. Baxter. Archibald Baxter was a 'conshie', a conscientious objector, who refused to fight. He was tried, convicted and sent to the front in France. One of his punishments was to suspended by his thumbs above the trenches to provide the enemy with target practice. He survived and wrote a little book about it. I was deeply moved by Baxter's story, and convinced about the utter brutality of the army, and that there was nothing positive about the military at all. Then one day I was walking down the main street in Auckland. I hadn't registered that it was close to ANZAC Day, and was a bit surprised to find myself watching a parade of old soldiers, some marching, some riding old military vehicles. Something made me look at these men. I saw old men, a bit stiff, a bit sombre, looking ahead, all wearing their medals. They had a sad dignity about them. And then something clicked and I saw how these men, these flesh and blood humans, had fought in wars half way around the world. They did so for different reasons. Some would have believed in the course, signed up and experienced a sense of fervour perhaps. Others would have been less willing. All survived but had watched friends and comrades being killed. I found myself moved by the sight of them. Tears welled up. These men had fought for me, foolishly perhaps, but they did so, and I felt some empathy for them. Later I came across something written by Dharmacari Subhuti. He gave my relatively incoherent emotional response a more reasoned basis. Subhuti reminded me that I enjoy considerable freedom. That freedom was won, in part at least, by those old soldiers fighting Hitler in Europe. Whatever the rights and wrongs, whatever the conditions, I knew that I should feel grateful that some men had laid down their lives so that I could enjoy my freedoms today. So I've come to have a more complex view of the military. I'm still resolutely opposed to violence, and to the use of force. But I recognise that others are not, that there are other people who are quite willing to use violence, and who are willing to fight, to kill, to achieve their ends. And I acknowledge that I want to be protected from being attacked and killed. So while I personally try to refrain from any acts of violence, and try to immediately confess any acts which stray into that territory, I would be a hypocrite if I maintained the view that the military is entirely evil. It would be hypocritical because I benefit from it. The situation today is far from morally clear - we westerners appear to be benefiting from wars of aggression in the Middle East. I don't pretend to understand all of the arguments, and don't have space to go into any of that here. But I want to acknowledge that men and women have killed and died, so that I may enjoy the freedom to practise the religion of my choice - of which non-violence is the highest value. And that is one of the greatest koans of our times. Last weekend I was away at a national gathering of the Western Buddhist Order in the UK. 340+ order members, a little less than half the UK order were there - practising together in harmony. So it seems fitting that this week I write about the Order. One of the aspects of our order which appears to cause consternation in some traditional Buddhists is that we are not a monastic order. So I'd like to spend some time looking at two related questions: Why did Sangharakshita found a non-monastic order? And, are we therefore a lay order? 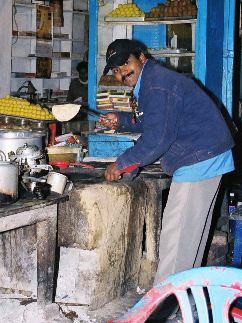 The received tradition of Buddhism allows for two categories of Buddhists - the full-timer, or bhikkhu (literally one who begs), who is bald, robed, celibate and somehow engaged in spiritual practice; and the part-timer or householder who is mainly focused on business and family, and who's spiritual duty is to feed the full-timer. Reggie Ray notes, in Buddhist Saints in India , that Buddhist society was originally tripartite with the full-timers being either forest dwellers or settled monastics. We could say this reflects a social structure in India where the Brahmanas were relatively settled, and the Shramanas tended to dwell alone and wander about. Even if Reggie had not pointed this out, it is obvious if you spend some time reading the Pali Canon that there are indeed two quite distinct lifestyles amongst the bhikkhus. One constantly comes across the advice to dwell alone in the forest meditating, at the same time one reads about bhikkhus living enmasse in viharas. Eventually, perhaps because they recorded the texts, the settled monastic came to be seen in the texts as the ideal Buddhist in the Southern Buddhist countries. The Himalayan Buddhists, especially in the Nyingma school, have tended to have a more diverse social structure: for example they have married lamas and full-time practitioners who are not monks. Later, with the emergence of truly Japanese forms of Buddhism in the Kamakura period, the Japanese abandoned the vinaya which meant they could have married clergy, and that Zen monks could work for their living. However the meme that the bhikkhu is the ideal Buddhist is one that persists. Sangharakshita spent nearly twenty years living in India, was ordained as a bhikkhu, and had plenty of opportunity to observe modern day bhikkhus. And what he saw was a lot of men going through the motions, shaving their heads, wearing robes, and refraining from meals after noon, but not actually attempting to Awaken. Although there may have been exceptions, formalism seems to have been the rule. We get a hint of why from Peter Masefield, an academic and Theravidan Buddhist, in his book Divine Revelation in Pali Buddhism, where he concludes that without the direct intervention of a Buddha that Awakening is impossible, and within a generation of the Buddha's parinibbana Arahants would have died out. Actually Masefield, despite his voluminous citations, has overlooked a vast number of examples which contradict his conclusions and the book is deeply flawed, although still in print. But if Awakening is not possible, then what is the point? The Tibetan Buddhists that Sangharakshita met did seem to have a living Buddhism. Despite the fact that many of them were not following the vinaya to the letter, or at all, they had a depth of practice that inspired Sangharakshita. Another facet of Indian Buddhism was that the Mahabodhi Society was, at that time, run by Hindus. Anyone could be elected to the governing body and ambitious Hindus had muscled there way onto the executive, even though they were not Buddhists, and some were even antithetical to Buddhism. This prevented the society from functioning effectively. Back in England in 1964, Sangharakshita found that nascent British Buddhism was thriving, but in a narrow way. It was all very genteel and quite sectarian. Sangharakshita found the insistence on strict Theravadin interpretation of Buddhism a bit stifling. Fortunately the English Sangha Trust decided to break off relations with Sangharakshita, which allowed him to start afresh. After a two year return to India to wind up his affairs, and consult with his teachers, Sangharakshita returned to England with the blessing of his teachers,and set about starting a new Buddhist movement. He was sure that it was going to be run only by committed Buddhists. He was also sure that he wasn't interested in formalism.Initially Sangharakshita envisaged a hierarchy of ordinations from upasaka/upasika up to the Bodhisattva ordination. However he came to realise that since Going for Refuge was the primary act that made one a Buddhist that only one ordination, one witnessing of ones effective Going for Refuge, was necessary. As a member of the Order I am someone who is acknowledged by my peers and preceptors to be practising effectively. I happen at the moment to have long hair; dress in jeans, teeshirts and trainers; do not have a sexual partner or children; have few possessions; live in a Buddhist community with six other men; work for a Buddhist charity; and consider myself a full-time (though far from perfect) practioner. I therefore combine aspects of the householder, and the bhikkhu, and indeed at times take up the life of a forest dweller for brief periods. Some traditionalists seem to struggle with this indeterminacy - I've been told, for instance, that because I don't follow the letter of the vinaya that I am a heretic that is distorting the Dharma. I guess it shows that fundamentalism is not something that theistic religions have a monopoly on. So to sum up, the Western Buddhist Order is not an order of monks or lay people, it is an order of effective practitioners. This appears to be radical in the face of the monk/lay model. But that model has never been intrinsic to Buddhism, it's just a cultural norm, and one that may not be relevant any longer.